paris fr, originally uploaded by michael_hughes. 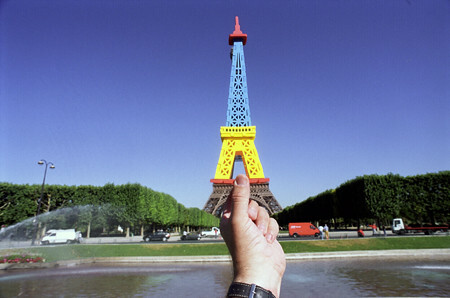 Michael Hughes shows us a unique way of taking that landmark shot using your own souvenirs. From replicas, CDs, magnets, postcards, mugs, plates and even a lollipop, Michael has you double taking on each of his photos. Can’t get enough? Visit Michael’s flickr for the complete set of souvenir photos from around the world. P.s. Thanks Dea for posting about Michael’s lovely photos. Thanks for the friendly mention. You can also download some of the photos to print for yourself for just €1,00. Visit my website and go to the Souvenirs page to do so. Lovely idea. Thanks for sharing Nina. I especially liked the Clock Tower one. This is soooo cute! Thanks for sharing! Wow. That’s a cute and very amusing concept!